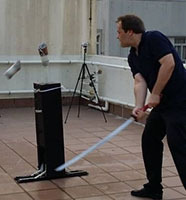 High quality Katana do not necessarily have to cost the earth. 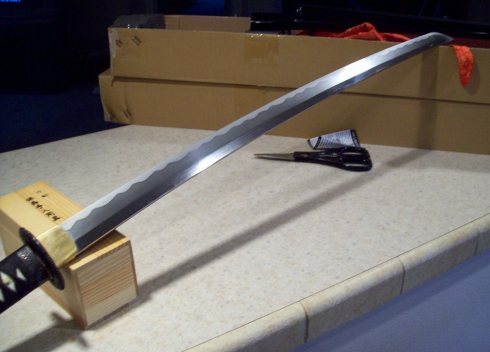 But first we must define what we mean by "high quality"..
To some people, a high quality katana is one that isn't made of stainless steel and can actually cut stuff in the backyard.. These can be had for well under $100 and are discussed on the site elsewhere. The majority of sword buyers, and the area that we specialize in, tends to focus on swords between $100 to $300. But we have already examined these in detail as well. Comparatively speaking, everything we have recommended so far can be classified as a high quality Katana when compared to the masses of cheap and nasty stuff out there. True enough, all of the swords we have looked at to date (apart from the cheap collectibles, which are made by machine) are hand forged. But none are made by a master smith, no matter what the description claims.. They are all made in China by blue collar workers or apprentices, usually using power hammers to assist them (not that there is anything wrong with that, they use power hammers do in Japan too). So the rule of thumb is, if a sword site claims their swords are made by Master Smiths in Longquan China - and sells for $300 or so - it is an outright fabrication! I can tell you this with confidence as I have been to Longquan and spoken with certified Master Smiths there and shown that while many brands and levels of swords are made under one roof, the level of quality varies dramatically. Here's a video I took documenting three levels of swords, cheap wall-hangers, martial arts grade swords and the real Master Smith forged stuff. Minor issues such as the odd scuff mark leftover from the shaping process or faint tool marks that are not polished out are largely to be expected. 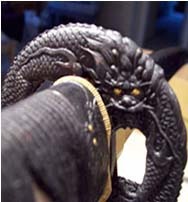 Other common issues include scrappy looking rayskin offcuts (the raw materials for a full rayskin wrap is around US$70), cheap synthetic leather or 'shoelacy' cotton ito on the tsuka (handle), a saya (scabbard) that rattles when shaken, ugly kissaki (tip), varying levels of sharpness and even some slight bends in the blade (and many other small imperfections that do not effect the swords overall functionality). To a large degree, some of these issues are unavoidable due to the price point and largely to be expected (though hopefully not all at the same time on a single blade!). Indeed, at their worst, sub US$300 swords can have serious issues with the handle, loose fittings that pass initial inspection but rapidly loosen over time (because of the way they are fitted in the first place) and other annoying or even potentially dangerous issues. While the better brands and sellers take care to weed their worst offenders out with scratch and dent sales - sometimes a lemon does sneak through QC, or in the case of some sellers, is just sent out anyway (and is met with silence if you try to contact them about getting a refund or an exchange). So if less than perfect is not acceptable and you want more than a dojo grade sword, you need to spend more..
Time is money, and to make high quality Katana takes both to do it right. While the general rule of thumb is "you get what you pay for", price alone is not always the best indication of quality (though it is a good starting point). Generally speaking, what we can define as true high quality Katana tend to start at around the $600 price point. They are made with more attention to detail, use better quality steels, forging techniques and materials by more experienced smiths. And yes, sometimes even certified master smiths (whatever you may think about swords made in China, there ARE highly skilled, and very proud, government certified smiths who make swords that their ancestors would be proud of). My first experience with the higher end was with a sword called the "Yasha" Katana which was made by a certified master smith, Chris Zhou. The blade was quite amazing - but it was fitted out on the cheap and as such, was something of a let down.. While the sword is no longer available - you can read the review and test cutting results here. It is a good introduction to high quality Katana, and also shows some of their limitations when I bent the thing trying to cut a thick tree branch..
Thankfully things have changed since I did this review, and the overall quality at the high end has improved dramatically. Here's some brands you should be looking at. The Hanwei forge have been making high quality Katana for years. They have experimented with many different steel types, forging techniques and built a solid reputation for quality at the higher end of town. 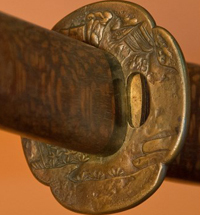 Their very FIRST sword has withstood the test of time, and is called the Shinto Katana. It is also one of the most affordable - despite having a MSRP of $990, it is available for just under $600 if you know where to look..
OVERVIEW: Hanwei's first sword and one of their finest. Excellent construction, handling and value for money. Highly recommended for anyone making their first foray into high quality Katana. While their swords are made by the Hanwei Forge, what makes the Bugei Sword Company stand out is that their Katana are special ordered by Sensei James Williams of the Nami Ryu, who designs and stands behind the company. The only drawback with Bugei swords is you often need to be patient when ordering them. And they aren't cheap, the average price is $1,500. But most people in the know agree they are worth it..
Made in Thailand, hence the name, Thaisuki Nihonto have long suffered from a bad reputation primarily because they used the word "Nihonto" and upset a lot of elitist enthusiasts - as the word itself can only really refer to swords made in Japan (though, to be fair, translated it only actually means "Japanese Sword").. While I too made the mistake of following along with the general consensus for years, upon actually checking one of their swords out for myself I was pleasantly surprised and found that they are on par with other high quality Katana on the market - not perfect, but certainly not as bad as the early consensus made out.. While not perfect, the Thaisuki model KTN5 Katana exceeded my expectations. This "lost" review was originally delayed as I thought I had lost the original pics and video during my move to Japan, but was found and reconstructed to show once and for all, the bad reputation Thaisuki suffered from is an unfair one. Started in 2003, the Imperial Forge specializes in top quality blades with practical (if rather plain) fittings to produce a line of high quality katana designed for dojo applications and competition cutting. 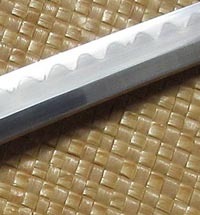 The blades really are quite stunning, folded 14 times and differentially hardened to produce a sword functionally almost identical to a Japanese made Nihonto but at a fraction of the price. In our hands on review we explore the strengths and weaknesses of this type of blade, and explore in more detail why if you buy a folded blade, you should avoid the cheap ones like the plague..
With a folded and differentially hardened blade in simple, but utilitarian fittings, the Kesshi Katana is visually stunning and performs extremely well on traditional targets. In this review we push it to the limits and beyond.. They have been doing the ren-faire scene for as long as anyone can remember and seem to polarize people into those that love them and those that hate them with nothing in between, mostly because the owner of Angel Swords is very proud and outspoken about the quality of his products. But the 'controversy' that surrounds this brand can make it hard to hear through all the noise.. In our hands on review, we take an impartial look at this company and their products, as well as some in depth behind the scenes discussion with the owner and let you make up your own mind as to if these are high quality katana worth the asking price or not. 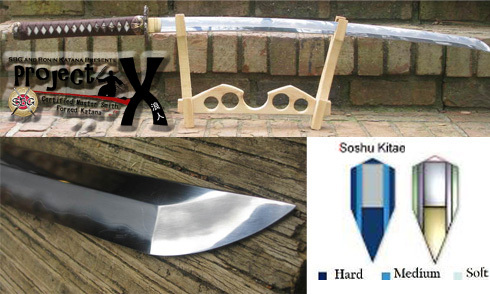 Project X is a direct collaboration between Ronin Katana and Sword Buyers guide with the objective to create the absolute highest quality Katana possible and make them as affordable as possible..
To do this, we have employed certified Master Smiths in Longquan and a complex lamination technique called Soshu Kitae. The only drawback to these swords is - availability. Demand is so high that for each run there are only two chances to reserve one, either by pre-order or first in first served.. Considering the price point, just $899.99 - it really is no wonder I suppose..
Click here for more information on Project X. One more thing, while Project X only happens once or twice a year at most and - due to demand - can be very hard to secure, an offshoot of Project X is forge direct.. These swords are the same price and same quality, but made to order and have a huge number of customization options..
OVERVIEW: Custom made swords at a set price made by Master Smiths - this review takes a close look at two designs I had made, and is a good idea of what you get when you spend more.. 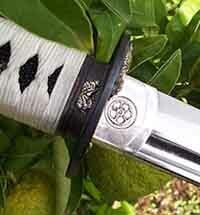 Naturally the pinnacle for Japanese swords are Nihonto - Katana made in Japan by Japanese sword smiths.. Yes, they are considerably more expensive - the starting price is around $4,000 and the average, somewhere around $7K - and yes, they can be quite complicated to import (for the best ones, ordering online is pretty much impossible - you need to go to Japan and PROVE that you are worthy to be the swords new owner!). But even if only to drool or dream, you can find links and more information on these amazing high quality Katana here on SBG. The more you information you have, the easier it is to make an informed decision. Thus, especially when deciding to invest in relatively expensive, high quality Katana, we strongly recommend doing as much independent research as possible before making your final buying decision. Pay special attention to the buyers return policies, if the sword is shipped from overseas it may not even be possible to return it - and look out for restock fees. Good sword sellers will work with you if you find a flaw they missed before shipping. Bad ones, will ignore you. So more than ever, buyer beware! The swords and sellers we recommend above are all tried and tested, but the further you branch out on your own - the more careful you need to be. There are some real scammers out there - so if it seems to good to be true, it probably is.